In the fall of 2015, Godyne Sibay and Ming Lau were paired in the ULI Mentorship program. These two women, from seemingly different professional backgrounds, turned a one-year program into a four-year (and counting) friendship filled with growth, stimulating conversations, and an ever-expanding network. As a recent graduate from Queen’s University’s Urban and Regional Planning program, Ming Lau was offered a position with SGL Planning — an opportunity that brought her from her home in Vancouver to Toronto. Fast forward 15 years and Ming started feeling a mid-career-itch. She was still being consistently challenged by her work and colleagues, but also was beginning to crave a change. “I was asking myself, what would my career and life look like in the next 20 years?” Ming reflects. “I knew what that would look like if I stayed, it was quite a straight line. But is that what I wanted?” Motivated by the desire to find someone that could provide her with a different perspective on her career, Ming decided to apply to be a mentee in ULI Toronto’s Mentorship program. Coming from a small firm, she went into the program hoping to be paired with someone that could give her a different perspective on her career. Her ideal mentor would be a woman who was not a planner and who understands what it takes to be a mother in the industry. “Lucky for me, I got paired with Godyne!” Ming says. Godyne Sibay is the Regional Managing Partner of McCarthy Tétrault in Ontario. Throughout her immensely successful career as a partner in the firm’s Real Property and Planning Group, Godyne has been lead counsel for numerous impactful projects that have helped shape Toronto into the city and region that it is today. Being a strong advocate for the inclusion of women in the Real Estate and Land Development industry, Godyne co-founded ULI Toronto’s Women’s Leadership Initiative and played an integral role in developing the program. Conceived during a breakfast between acquaintances, WLI has three core missions. It seeks to, firstly, increase the promotion, advancement and accomplishments of women in the industry. Secondly, it aims to increase the visibility of women in Real Estate leadership roles. Finally, it looks to increase the number of women who join and actively participate in ULI. Her feature on WLI’s She with He podcast further outlines Godyne’s background and how she has made it to the prominent position she occupies today. “I think the one thing that really helped was that we hit it off. It was not stiff or over-formal at all,” says Ming. Over the one-year program, the success and impact of Ming’s mentorship was ensured by not only engaging in professional and career-oriented conversations, but by also being a space where Ming could bring personal questions. Godyne created a space where career and personal life were interlocked and could be openly shared and explored. From balancing family with career goals to climbing the corporate ladder as a woman, Godyne encouraged her to push and open her boundaries and comfort zones, widen her sights on what she really wanted in life, and to be open to hear the answers to questions that she may not have known she had. Being a firm believer in the power of a growing network, Godyne also introduced Ming to several of the impactful and motivating women in her circle. Four years later, two of which she spent considering the unexpected offer and preparing for the position, Ming is celebrating more than a year working alongside Godyne as a Planner for McCarthy Tétrault in Ontario. Sitting in that room and listening to their stories, it’s not hard to see why these two impactful women hit it off from the beginning. Their fearlessness, compassion, and drive to better the community around them is contagious and deeply inspiring. As parting words, they reminded me that the most important takeaway in all this is to open your mind. That sole action often leads to finding things you didn’t know you were looking for. It can often be as simple as getting involved, looking for new opportunities for growth, or walking into a room with a wide-open mind, just like Ming. 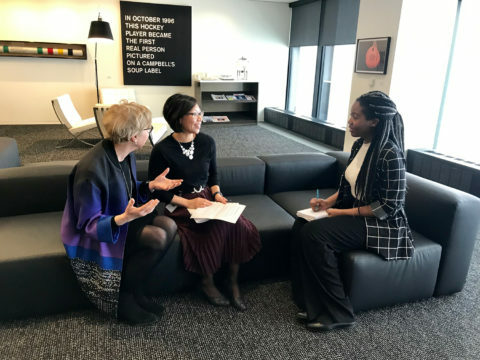 Carbelle Djossa interviews Godyne Sibay and Ming Lau at the McCarthy Tétrault offices in Toronto.